This little lot came from Karen aka Shamu Makes, a surprise 'grab bag' of yarn and fibre. She chose perfectly for me - the colours are beautiful and I couldn't wait to get spinning. 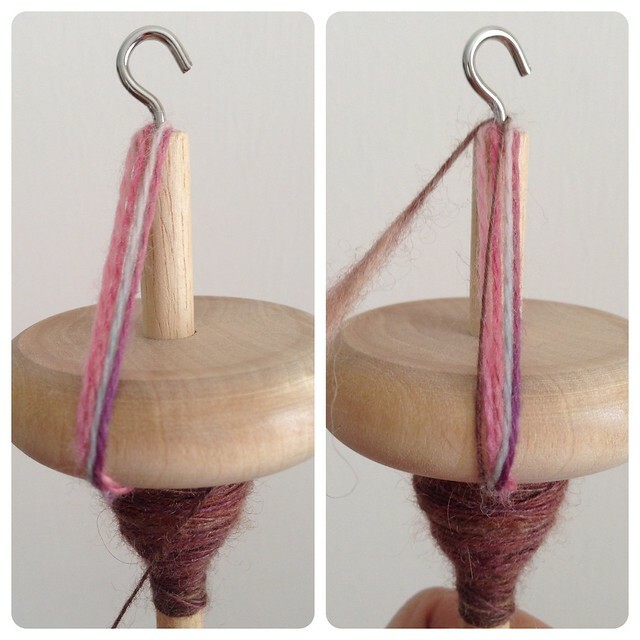 As my beautiful bottom-whorl rainbow spindle is already full (and I mean full!) of singles, I had no option but to make a truce with the top-whorl spindle I didn't really get on with a couple of weeks ago. I'm sure there is absolutely nothing wrong with the spindle - this is about my lack of experience - but I had two issues with it (a) there is no notch and my leader kept slipping which meant it was unravelling the cop, and (b) it doesn't spin for very long meaning a high risk of it stopping, changing direction and unspinning the twist... then dropping to the floor. Step 1 : After attaching the leader yarn, bring it up around the hook and then back down to the shaft to continue as normal - this will create a 'stopper'. Step 2 : With the leader to start, and with the yarn after spinning and winding on, bring the spun yarn to one side of the stopper and then across it into the hook. When you spin, the stopper will prevent anything from moving or unravelling. 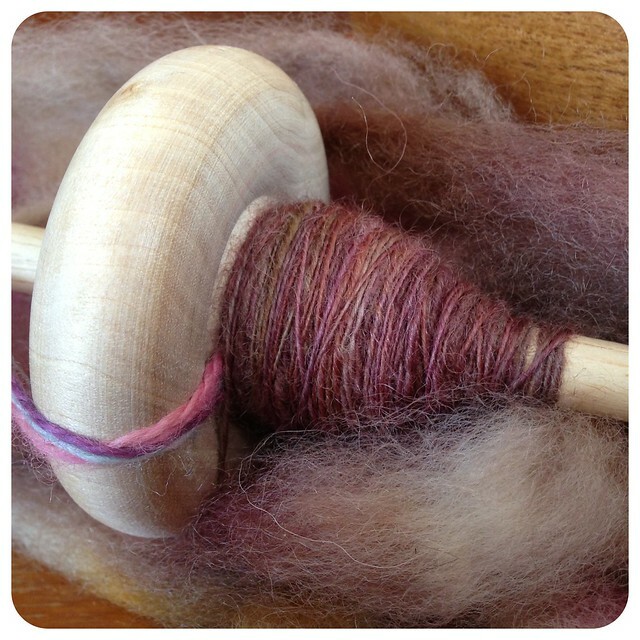 This spinning lark is seriously addictive! That's a clever trick! A notch is pretty essential in top whorl spindles, and you might have better luck/longer spin time with a heavier, wider whorl. Yes, this is why I prefer the other one. I also have a trndle on the way, although that is top whorl. 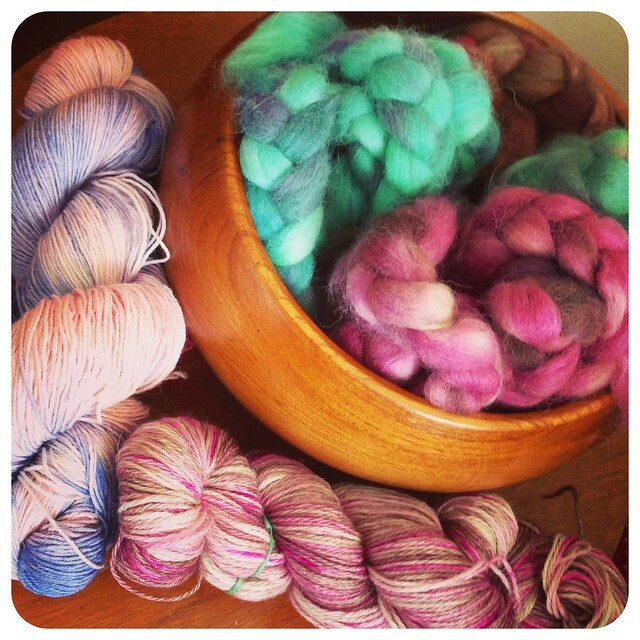 Lovely colours from your grab bag. Happy spinning. I loved picking the grab bag out for you and am so glad you like it! Such pretty colours! You are so right about spinning being addictive. I can't stop and it's eating into knitting time. Glad you ae getting in better with your top whorl spindle. It's amazing what a tiny bit of experience can do, isn't it? Wow, your spinning is coming along amazingly! You may have tempted me back to my spindle! I will have to Pin this post as I think my drop spindle doesn't have a notch for the leader.